I have been entering sweepstakes online since 1997. I have won prizes worth thousands of dollars, including trips, private movie screenings, cash, and electronics. My latest prize (an iPad 2) renewed my interest in a hobby that I had taken a break from recently. While some things have changed over the past 14 years, these principles have stayed the same. 1. Entering should be free. A true sweepstakes should have no entry fee and, in most cases, is a randomly selected promotion where every entry has an equal chance of winning. A purchase should not affect your chances of winning, and any giveaway that asks you to purchase something should have an alternate way to enter without buying. (Note: Many of the promotions that offer alternate entry methods will require you to do so by mail. You will incur postage costs to do this, but the alternate entry method is still considered “free.”) If skill is involved, it is considered a “contest” and isn’t truly random. 2. Taxes aren’t quite what they seem. I’ve heard many people say that they have avoided big sweepstakes because of tax liability. This, to me, seems a bit generalized, because everyone has a unique tax situation, and a prize winning will affect everyone differently. The tax law in the U.S., for example, requires you pay income tax on the ARV of your prize. If you win a washer/dryer combo, you will get a 1099-misc at the end of the year and will be asked to pay taxes on that amount. You would, essentially, just add the actual value of the pair to your stated income. You do not pay social security, Medicaid, and disability taxes on this amount, and if the amount listed by the sponsor is higher than what most models are selling for, you can adjust this amount down at tax time. If the value of the washer/dryer is $1000, for example, then you are simply claiming $1K more income on your tax statement. The amount you actual pay will depend on your tax bracket. If you don’t usually owe taxes, or they are low, the actual tax bill could be minimal. The email comes from an overseas agent. The prize or prize company uses the term “lotto” or some other foreign term for prizing. 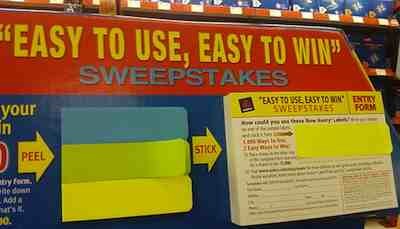 Remember, sweepstakes are not the same as the lottery. There is no contact information for the prizing company or the person delivering the prize. They ask for any payment of any kind for delivery or “claim” to your prize. In other words, if it smells fishy.. it’s not likely a reputable giveaway. Do not give any information to these people. 4. It takes some time (and effort) to win. Ever since the airing of the TV special “High Stakes Sweepers”, more and more people have been hoping to win big via sweepstakes. On the forums and in the chat groups, newbies announce that they will be entering so that they can win a new car or lots of cash, and they will expect to start getting these prizes within a month or two. Here’s the deal: its takes hours of work and months of patience before most people see a win beyond a free product coupon or a music download. I didn’t see my first big win (over $500) until three year into the hobby, and I entered every day! With increasing competition due to the fact that most giveaways can be entered for free online, winning can be even more difficult. If you are hoping that the hobby will be a full time job or can bail you out of trouble, you are better off getting employment somewhere. What about you? Do you enter sweepstakes? Are there any fun wins you’d like to share? And chances are the companies will collect and save your contact information for promotions in the future.